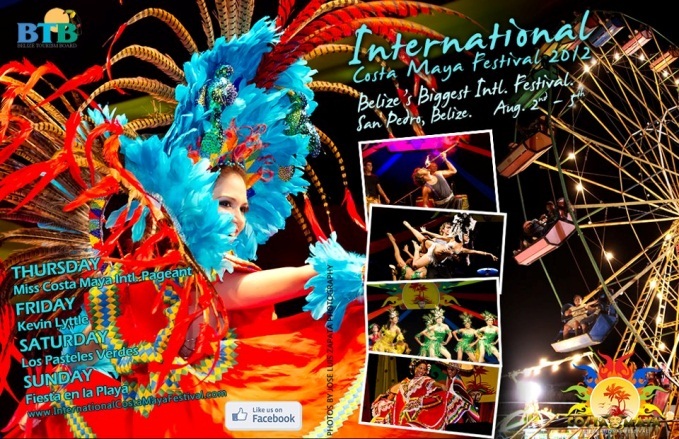 Home » Entertainment » Official Countdown to the 20th International Costa Maya Festival BEGINS NOW! Celebrating the culture and ancestry of the Maya and the completion of the Maya Calendar 13th Baktun-under and highlighting the beauties of the Mundo Maya World, Belize is once again proud to host the the International Costa Maya Festival from August 2nd – August 5th, 2012 on the beautiful island of San Pedro. The International Costa Maya Festival, first held in 1992, was organized to unify the Mundo Maya world, bringing together representatives from across Central America to showcase their Mayan Ancestry, which has now become one of Belize’s most anticipated annual events. This year, the Costa Maya Committee has put together a full and pulsating list of entertainment and events to satisfy friends and family alike. Today, to kick start the events will be the amiable arrivals of the 8 beautiful delegates vying for this years’ Reina Del La Costa Maya title. The lineup for this year are Miss Belize - Karen Jasmine Middleton, Miss Panama - Karen Elena Jordan Beitia, Miss Honduras - Esthefany Maolyth Piñeda Perez., Miss El Salvador - Nathaly Jazmin Mena Arauz, Miss Nicaragua - Ivey Jellisa Alvarez, Miss Guatemala - Alessandra Manzur Franco, Miss Mexico - Natalia Villanueva and Miss Costa Rica - Mariela Aparicio. Upon arrivals, the delegates will be transported to the San Ignacio Resort and Hotel where they will be hosted for dinner and enjoy a mystical Maya Tour along with an official photo-shoot early tomorrow morning. On Friday, July 27th, the delegates will depart for their official arrival to La Isla Bonita, and Ramon's Village Resort, which they will call home for the next 10 days. The Costa Maya Committee and the people of Belize would like to welcome them all to our country and wish them all the best in this year’s pageant. The Committee also invites the Belizean public to keep abreast of all the new and exciting announcements for this year’s festival such as the Opening Gala and Live Entertainment segment, Live Performances by Kevin Lyttle and Peru’s “Los Pasteles Verdes”, Fiesta en La Playa- along with the DJs and Beach Volleyball Party and other beach activities.